Nik was in a band called Hog and was persuaded by Fusion band leader Reg Webb to join them and leave his then full time government job in Ipswich. 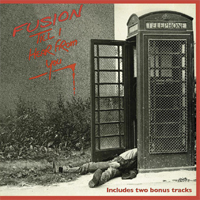 Fusion was as the name suggests playing some of the finest and funkiest soul and jazz tinged music in Britain at that time. The opening track “Till I Hear from You” is an early rendition of “Human Racing” which was eventually to become the title track of Nik’s first solo album. The plastic swing of 'Big Brother' and 'In The Union Now' might ring the harmonic - and social - changes the '80s would bring, but 'Champagne Lady' recklessly strides into the disco domain of the previous decade, its memorable chorus abetted with Kenn Elson's bass. Such a groove gives an infectiously warm spank to the record's title track, six-string strum scratching the synthesizer-and-organ jive and brass oiling Webb's effusive vocals, while 'Play Around' brings an unexpected bout of rock 'n' roll into the mix. 'If I Had The Chance' bristles with riffs, too, yet the Kershaw-penned 'Suchi' flows so soulfully it transcends its era and, with its opulent keyboard carpet, spills over into prog. Conversely, the dry 'Pain Of Love' borders on the out-of-tune mannerism, and why it wasn't replaced with a boppy, sax-kissed bonus 'Hey! Mr Wonderful' is another mystery. Who's the loser now, then? With this reissue, everybody wins. For Kershaw fans, of which I count myself one, Till I Hear From You will make for a classy insight into the musician and his formative years (of which in the excellent liner notes he admits to still be proud and appreciative of - Webb is interviewed as well). However over and above that, what Fusion were doing just over three decades ago will still put a huge smile on the faces of any UK Funk and Soul fan and ultimately that's what matters most.